New York-based artist Rebecca Reeve debuts new photographic work in Sun Breathing, her first solo exhibition at Portland’s Upfor Gallery. In her archival pigment prints, Reeve imposes grid-like forms or painted elements on the natural environment. She then photographs these optic interventions, intentionally muddling the internal and the external as a means to explore the dichotomy between restraint and unbounded potential. Readily recognizable foliage and nature scenes form the crux of Reeve’s content. The addition of vibrant reds, yellows, and blues made by Reeve’s brushstrokes and not readily visible in the prints, are what distort these standard photographs into more fantastic and illusive scenes. Organized chromatically on the three main walls of the gallery are two sets of two prints and one of three, each grouping separated by the primary colors painted into them. 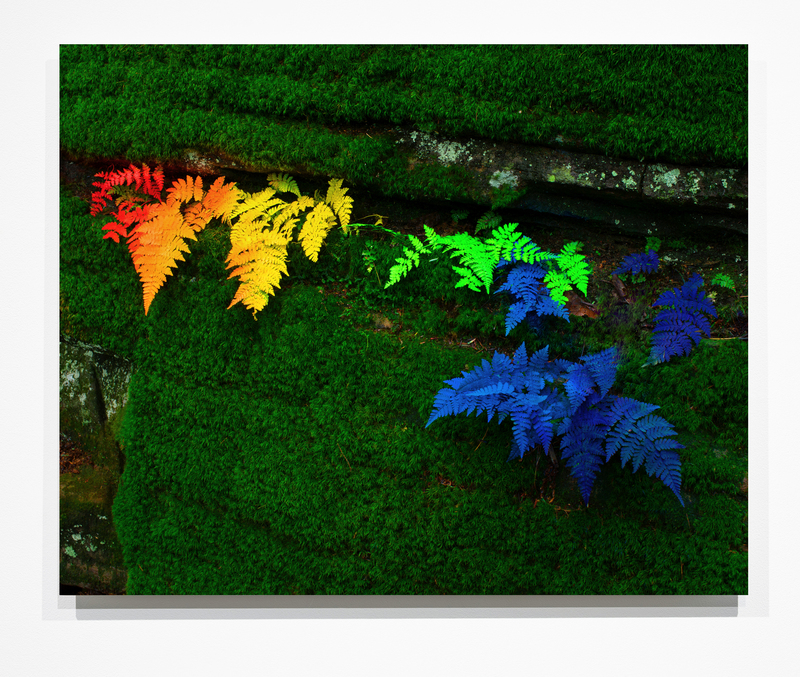 On the wall opposite the set of two red prints is the final piece of the exhibition, Sun Breathing #8 (2018), which is the only work that combines all three of those colors to create an artificial rainbow resting on the vegetation. Although the inclusion of these vivid colors obfuscates the realistic quality of the land forms, they simultaneously serve as bold hooks that drive the audience deeper into the image. Where naturally-colored foliage typically camouflages itself in the wild, allowing for a much hastier overall portrait, the reds, blues and yellows painted by Reeve and then photographed in situ make the viewer precisely aware of each individual leaf and twig that might otherwise have been missed. Pushing against unfocused, cursory glances, the longer one studies these landscapes the more forcefully the applied colors come to feel as natural as the background shades of green. Rebecca Reeve, “Sun Breathing #4,” (2018) archival pigment print, 30 x 37 inches, edition of 5. Photo by Mario Gallucci, courtesy the artist and Upfor. 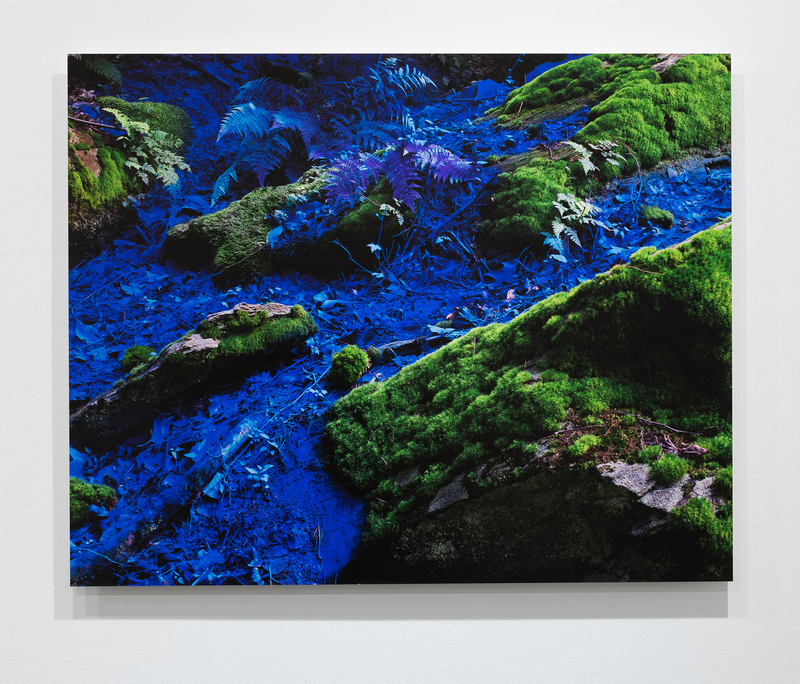 In Sun Breathing #4 (2018), the blue pigment that Reeve has meticulously painted into the earth feels as much of an opposing force as it does a part of the original composition. Quite acutely one can tell that the various ferns, branches and other plants have had an external hand in their tinted appearance. However, taking in the composition as a whole, the overall image they concoct can be likened to a small river or a stream flowing through the forest. The shadows give a sense of rippling movement and the angle from which the shot was taken alludes to the way a body of water may flow. In this sense, Reeve gives us another narrative to consider. While at its very basis it is a still image of dense foliage and moss, the inclusion of the cerulean shade opens up the possibility for more offbeat and whimsical interpretations, ones that can be as temperamental as the sun or a breath of air. This collection was shot over the course of one summer in Upstate New York. Fascinated by the observation and mapping of biological rhythms, Reeve devised the title for this exhibition from a phenomenon in which the atmosphere “breathes”, expanding and contracting in correspondence with the changes in the solar magnetic fields. Similarly, as the sun rotates and the seasons shift, new plant life is constantly blooming and regenerating. This expansion and contraction, of space and form and life, and they way our perception of it all can be manipulated is precisely what Reeve is looking to document with these works. The pops of blue or red bring in new and unexpected life to an otherwise visually neutral landscape while the addition of a gridded venetian blind limits the composition to the four-corners of the household object. Gallery goers are tested: Will we choose to see only what is in front of us, or will a barrier only encourage us to push past and see through to the other side? Rebecca Reeve, “Sun Breathing #1,” (2018) archival pigment print, 40 x 50 inches, edition of 5. Photo by Mario Gallucci, courtesy the artist and Upfor. The prints remind me of the work of the painter Agnes Martin and her prolific and emotive use of grids documenting her connection to the New Mexican landscape. Over the years, I have developed a soft spot for what the inclusion of lines and “formal” structures to otherwise expressive creative works can open up for both maker and viewer. It is the confusion of sensory perception, of taking a hard edge and smoothing it down to make it into a softer intention that draws me to both Martin’s and Reeve’s works. 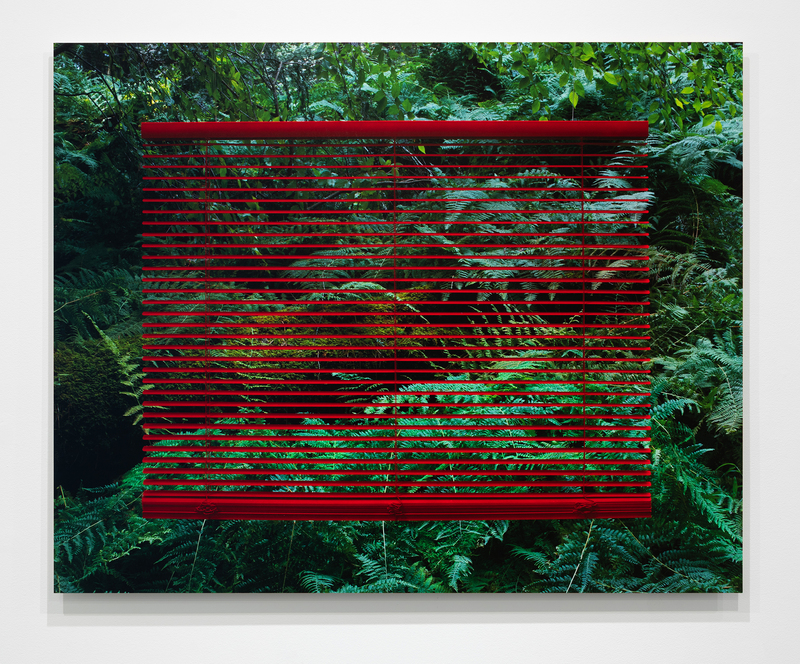 In Sun Breathing #1 (2018), the red curtain blind appears comically sharp as it floats in front of the heavy background of plants, making it seem as though it was digitally green-screened into the print. It is only if one gets nose-close to the work that the faintly translucent fishing wire from which the blind is suspended is visible. In this sense, the typically rigid grid of the blind serves a dual purpose: while it may impose a certain restraint on our participation with the image as a whole, knowing that it hangs somewhere just beyond our limited view allows for a larger interpretation of the scene. We may hone in on the particularities we are privy to in front of us, through the visible slats, while also acknowledging the tether to a greater natural and artistic environment. In my understanding, the blinds act less as they typically might, as a restraint on viewing. Instead, they are intended as a makeshift portal, tempting and coaxing us into the wild, asking us to peer through and beyond what is mounted in front of our line of vision. The inclusion of the domestic window shade provides a form of comfort for the viewer, allowing for an easier approach into something much more vast and enigmatic. Customarily, such objects would exist only in the interior of a home where one expects to feel safe and unsurprised. The shock of installing these grids in such an uncharacteristic location tasks the audience with making sense of their newly appointed place of existence. Take Sun Breathing #7 (2018), with its canary yellow hue drenched atop the landscape of fallen logs and grassy brush. If observed for an extended period, what was at first a jarring color begins to blend in with its surroundings, calling into conversation the autumnal yellows, oranges and browns of fallen leaves and drying bark in the background. In time, it is hard to imagine a moment when this scene once lacked the bright yellow paint that now seems as if original to the landscape. This dichotomy between lived experience and its more whimsical reinterpretation is what makes this body of work much more than a collection of photographs of Upstate New York. The depth added to them by the simple inclusion of color and line unearths a freedom to think beyond a conventional narrow frame. Rebecca Reeve, Through Looking 33.1, Through Looking 33.2 and Through Looking 33.5; (2018) archival pigment prints, 20 x 16 inches, each, edition of 3. Photo by Mario Gallucci, courtesy the artist and Upfor. Kate Simpson covered Reeve’s previous body of work entitled Through Looking for Aesthetica Magazine. 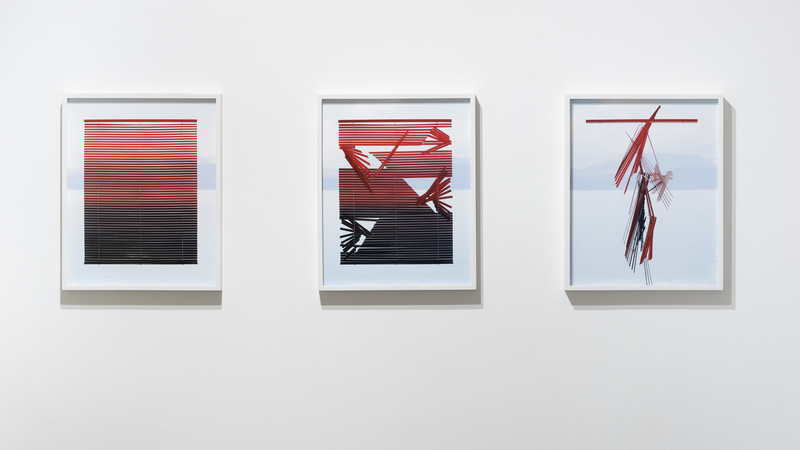 Of this series, three prints are concurrently on display at Upfor alongside Sun Breathing. In these previous works, Reeve similarly toys with perspective and the traditional approach to image-making. Again, bright colors and grids have just as equal of a stake in the process as do photographer and camera. Blinds play the prominent role in capturing our attention and framing the natural world, marking the space as if into existence. In a sense the experience is akin to that of a discovery, the blinds allowing the audience to frame the space from a new perspective, demonstrating that a more limited view of a composition does in fact have the ability to reveal to us a greater sense of the intricacy of the work. While the same elements are in use for both collections, Through Looking 33.1, Through Looking 33.2 and Through Looking 33.5 (also 2018), distort this unveiling effect more radically than the soft ease with which Sun Breathing conflates the two opposing forces. The blinds in Through Looking become progressively more mangled and warped, while a simple blue skyline stays consistent in the background. These earlier works make the blinds the central foci of the prints, reneging on the desire to meld the disparate forms of tangible object and vast scenery into a cohesive unit. They suggest perhaps a more ominous incompatibility, and unwillingness to coalesce than the natural union seen in Sun Breathing. Simpson writes, “[t]he works offer a renewed perspective of our place within the world, evoking a mirror-like awareness of how interior and exterior landscapes are increasingly separated. Ultimately, they encourage us to meditate on the cardinal rhythms of life.” In having both collections as reference, I would agree that much of what Simpson sees in Reeve’s Through Looking is repeated in Sun Breathing, if only to be further enhanced. The grid-like form of the blinds used in both bodies of work do reflect like mirrors, encouraging a thoughtful consideration on how interior and exterior life are explored and contrasted by the artist. However, I would say that whereas Through Looking seems to further push the divide between the two, Sun Breathing brings the external and the internal closer to a mutual existence. In quite literally charting the rhythmic fluctuations of the sun, the photographs in Sun Breathing do more to comfortably situate one within the other, creating a parallel between the diametrically opposed forces. Rebecca Reeve, “Sun Breathing #5,” (2018), archival pigment print, 24 x 30 inches, edition of 5. Photo by Mario Gallucci, courtesy the artist and Upfor. To be surrounded by these paintings is to let out a breath you did not know you were holding in. Much in the same manner that these prints are a visceral response to their location, the bodily reflex that occurs in their presence is nothing short of awe-inducing. In toying with perspective and illuminating the minutiae of lush forest foliage, these eight prints mimic the binary of breathing, mirroring the way it can be both free and restricted. The ripple of a breath is to the rustle of a tree top, as is the light of the sun to the shade of the moon, and the vibrancy of a crimson hue to the hard edge of a line. Reeve understands these inherent divergences, yet demonstrates that the magic of these seemingly conflicting phenomenon lay in their simultaneous observable beauty. They are not still lifes, they breathe life. Upfor Gallery is located at 929 NW Flanders Street, in Portland, OR. Their gallery hours are Tuesday through Saturday, from 11am to 6pm. Sun Breathing runs through March 2nd, 2019.